If you decided to switch from Android to iPhone and you liked your ringtones in your Android very much, you could find some methods to move Android ringtones to iPhone. As for how to transfer ringtones from Android to iPhone, you can check out this guidance to help you. As the Android ringtone and iPhone ringtone are different in format and length, you first may need to convert Android ringtones to iPhone M4R. M4R is the format used for iPhone ringtones, and its length shall be less than 30 seconds by default. The popular formats for Android ringtones are MP3, MIDI, MPEG and so on. There is no definite limitation on the length of the Android ringtones. 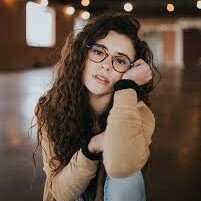 In fact, most of the audio formats can be used by Android ringtones as long as your Android can play them in its player. This tutorial will recommend you use Leawo Video Converter as a good assistive tool to convert Android ringtones to iPhone M4R tone file easily. After that, you can use iTunes or Leawo iTransfer to transfer the converted Android ringtones to your iPhone without any difficulty. M4R is a format that can be used on iPhone as ringtones. If you want to solve how to transfer ringtones from Android to iPhone, you can use Leawo Video Converter to make it easily. 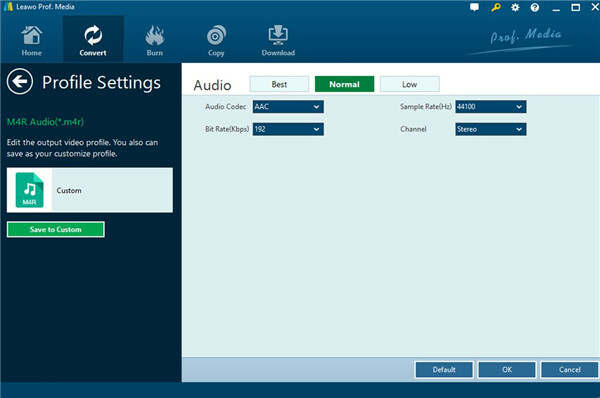 This tool is quite simple to handle, it can help you to convert many formats from one to another, like from AVI to MOV, from RMVB to MP4, from MP3 to M4R and etc. Therefore, it certainly can convert Android ringtones to iPhone M4R tones, which will also not lose the original quality of the Android ringtones in the converting process The detailed steps on how to convert Android ringtones to iPhone M4R tones with Leawo Video Converter are as follows. Here I would like to take MP3 as the format of Android ringtones for instance. 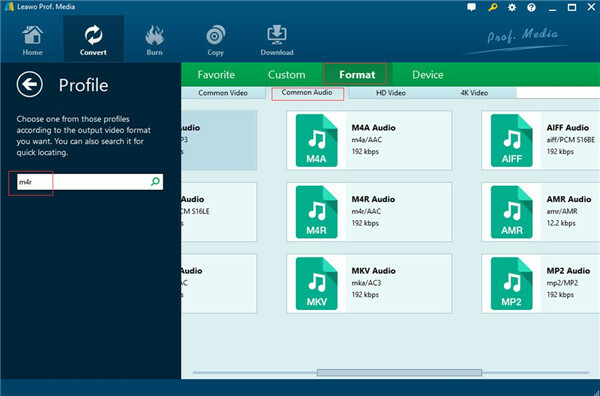 Run Leawo Prof. Media on your computer and then tap “Video Converter” to access to the function section of it. Connect your Android to PC and your computer will detect it as an external hard drive. Afterwards, click on the button of “Add Video” to browse your Android file folder to add your Android ringtones to the software. You can also drag and drop them directly into this program. Tap the sub-menu under the “Convert” button in the interface. Then you need to choose the “Change” option to select “M4R” as the output format of the Android ringtones from the “Common Audio” panel under “Format”. 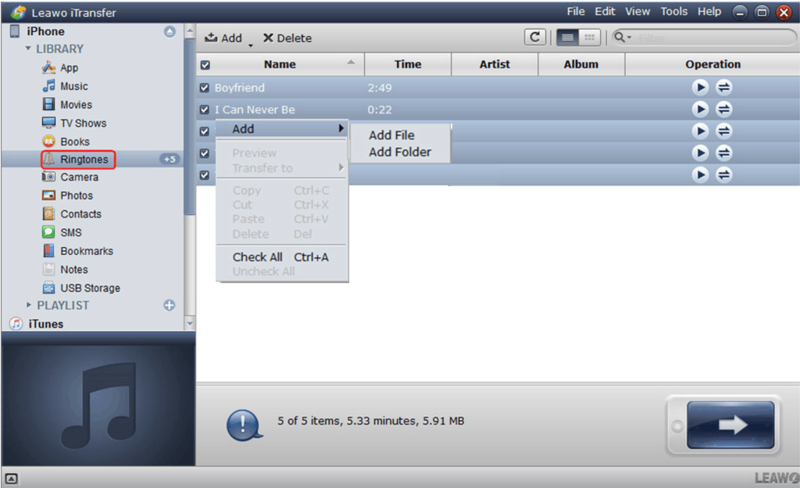 Afterwards, tap the button of “Edit” on the drop-down panel to set the detailed parameters of the output M4R audio files. Click on the button of “Convert”. A pop-up panel will direct you to set the output folder to save the converted files on your computer. After that, you can tap the other “Convert” button at the bottom of the interface to initiate the process to convert Android ringtones to M4R. When the converting process is over, the M4R files will be accessible on your computer folder. Then you can move Android ringtones to iPhone with these M4R files. The following two parts will show you how to transfer ringtones from Android to iPhone after you have converted the Android ringtones to M4R. After you get the M4R files on your computer from your Android, you can use iTunes to help you solve how to transfer Android ringtones to iPhone. The sync function of iTunes is easy to use to help you. You can refer to the detailed steps shown below to begin to move ringtones from Android to iPhone. Step 1. Launch iTunes with the latest version on your computer. Navigate to “Edit > Preferences” and then click on the “Devices” option to check “Prevent iPods, iPhones, and iPads from syncing automatically”. After that, click on “OK” to save your changes. Step 2. Connect your iPhone to computer with USB cable. Afterwards, head to “File > Add File to library” or “File > Add Folder to Library”. Browse your computer to find the converted Android ringtones and add them to the library of iTunes to prepare to move Android ringtones to iPhone. Step 3. Click the iPhone icon and then tap “Tones” to continue to solve how to transfer Android ringtones to iPhone. 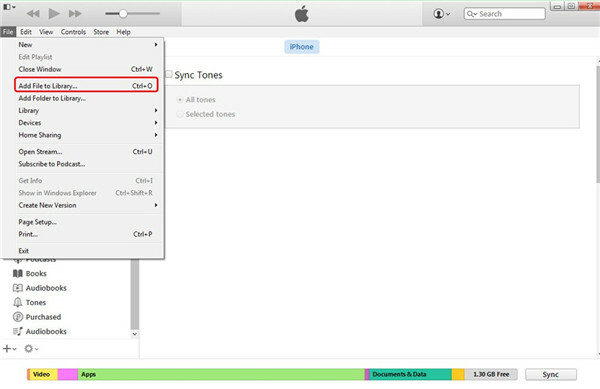 In the right part of the interface, choose “Sync Tones” to click on and then check “All tones” or “Selected tones” that you want to sync to iPhone. After that, you can click on the “Apply” button to initiate the procedure to transfer ringtones to iPhone with the help of iTunes. In a few minutes, you can solve how to transfer Android ringtones to iPhone completely. 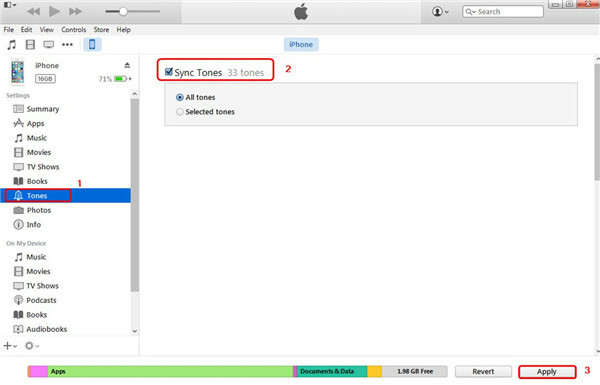 In the sync process of iTunes, your previous tones on iPhone will be covered. If you do not want to lose the existed tone files on your iPhone, you can use a 3rd-party tool to help you to move ringtones from Android to iPhone. To move ringtones from Android to iPhone is not a tough task after you have converted the Android tones to M4R files on computer. You can take advantage of Leawo iTransfer to deal with the problem of how to transfer ringtones from Android to iPhone without any limitation. Let’s begin to check out the detailed introductions on how to use iTransfer to move Android ringtones to iPhone perfectly. Launch Leawo iTransfer on your computer and then plug your iPhone into PC with proper USB cable. 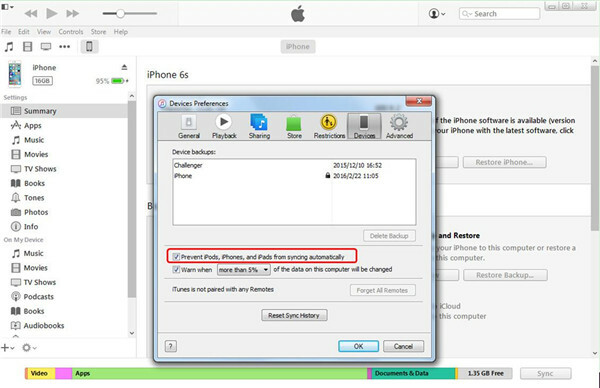 Thus, the software will detect your iPhone automatically to prepare to solve how to transfer Android ringtones to iPhone. After you have converted Android ringtones into M4R files on your computer, you can continue to move ringtones from Android to iPhone with iTransfer. For this purpose, you need to click on “iPhone icon > LIBRARY > Ringtones” to check all ringtones on your iPhone. Then you can click on the “File” button in the interface. In the next panel, click on “Add file” or “Add Folder” to browse your computer to find the converted M4R files to move to your iPhone. The last step to move ringtones from Android to iPhone is to right-click on the ringtone you would like to transfer and then click on “Transfer to > iPhone” to begin the transfer process. After a while, the Android ringtones will be available on your iPhone with the M4R format. As you can see iTransfer is more professional in solving how to move Android ringtones to iPhone. It can help you to manage 12 types of files among computers, iDevices and iTunes. If you just need an effective transfer tool, I suggest you use iTransfer to solve various transfer problems.